Neptune Diving Adventure – is the Skandinavia Dive Shop, run by Swedish Jesper who also offers tours to the southern Cebu town of Santander. Blue Abyss Dive Shop – is located only 50 m from Mayas Native Garden, it’s run by a Swiss/German. Instructor Klemens shoots some amazing video. 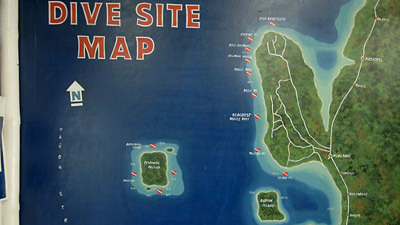 Savedra Dive Center – is the largest Dive Center on the beach, it’s run by German Karl H. Epp. Nelson Dive Shop – is one of the oldest dive shops and is run and owened by local Pinoy Nelson Abenido. Visaya Divers (German) in the Quo Vadis Beach Resort. All shops offer good and professional services. Moalboal is a well known place for diving. 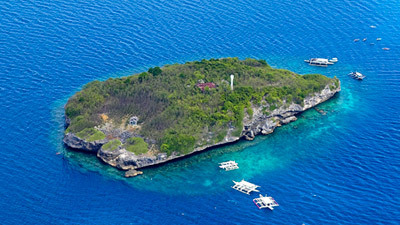 Mainly because of Pescador Island, an Island that rises in the middle of Tañon Strait and offers pristine marine life.